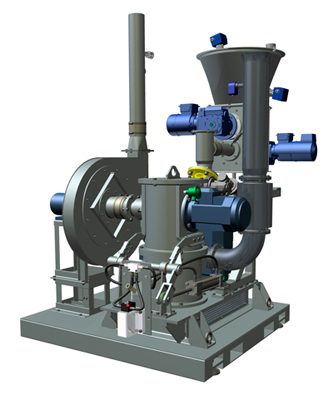 BICARMILL is a turnkey system for the grinding and injection of sodium bicarbonate for industrial use. Optimal energy efficiency, excellent electro-mechanical control, systems and hardware and software management in a single box for grinding and propulsion of the reactant sodium bicarbonate. STM has been developing and marketing advanced technologies for the field of fine and ultra-fine grinding since 1980, and for the last twenty years in particular its has been working on grinding sodium bicarbonate for smoke depuration. On the strength of this long experience, STM aimed to design an innovative machine which is a perfect integration of mechanical and electronic technology, guaranteeing unrivalled performance in terms of reliability, productivity and energy savings. The optimum use of power which results from the new horizontal layout of the grinding surface combined with a highly efficient classifier is confirmed by the minimal temperature increase detectable inside the grinding chamber. This indicates that practically all the energy is used for grinding, and not dissipated in the form of heat. If we consider that over the lifetime of a mill, energy costs are significantly greater than the initial investment, efficient energy use is crucially important both economically and from an environmental point of view. BICARMILL is designed to be positioned and installed on a simple stand. It does not need to be fixed to the floor, as the mill's control system ensures perfect operational stability. 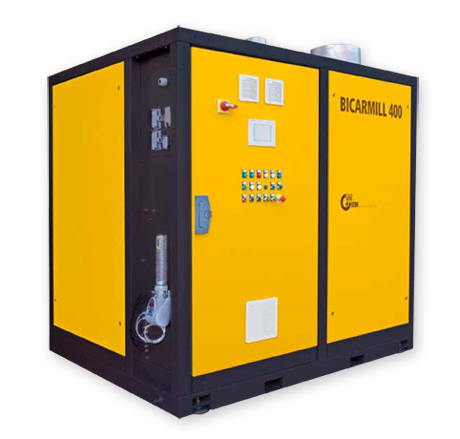 To comply with increasingly stringent regulations on noise levels, BICARMILL is enclosed in a soundproof cabin with interior lighting and panels which can be quickly dismantled to access all the mill's working parts safely and easily. 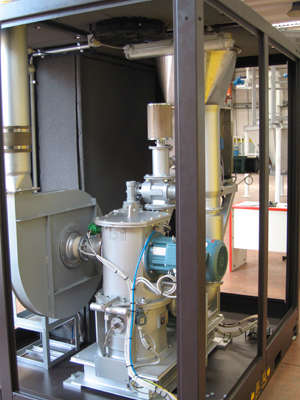 BICARMILL represents a revolution in mills for sodium bicarbonate; the system is complete with all mechanical and electronic components, fully tested and ready for use. The client only needs to plug the machine in to the power supply, add the sodium bicarbonate and connect the injection point, and the BICARMILL system is ready to go: a top quality, reliable product which reflects all STM's knowledge and experience.